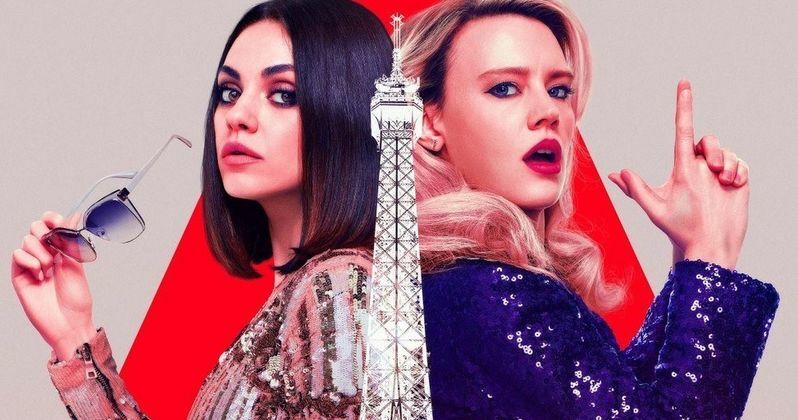 Really funny comedies are hard to come by this summer, but Mila Kunis and Kate McKinnon arrive to save the day this August in The Spy Who Dumped Me. The pair are getting embroiled in a bit of old fashioned espionage, and it looks like we're in for some laughs. Today, we get the payoff poster for The Spy Who Dumped Me. It features both Mila Kunis and her partner in crime Kate McKinnon as they get ready for some action and excitement. And best of all, we're promised a Vespa chase. The Spy Who Dumped Me tells the story of Audrey (Kunis) and Morgan (McKinnon), two best friends who unwittingly become entangled in an international conspiracy when one of the women discovers the boyfriend who dumped her was actually a spy. Along with the colorful payoff poster, we also get an exciting and hilarious clip from the comedy action thriller. Audrey and Morgan jump into a cab under the guise of Mr. Yang. Their dimwitted driver accepts their ruse and decides to give them a ride. He offers to turn on some music, but the girls would rather he just drive. That doesn't sit well, as the driver really wants to show off his DJ skills. Just as the driver is getting down to one of his own hip-hop mixes, a trio of machine-gun toting motorcyclists appear in hot pursuit. Audrey tells her driver that they're being chased, and that she needs him to lose them now. The driver takes this as a challenge and puts the pedal to the metal careening through the streets at top speed. He then reveals he smoked a ton of meth before he got in the car. One of the motorcyclists crashes hard, sliding into a stack of bikes. The taxi driver is quite proud of himself, attempting to get a high-five from Audrey as Morgan screams on in terror. Things don't end well for the driver though. Before he can get his high-five, one of the surviving motorcyclists pulls up to the side of the car and sprays him with bullets. How will Audrey and Morgan get out of this one? We'll have to wait until a little later in the summer to see how this all plays out, when The Spy Who Dumped Me is in theaters. Along with the clip and the payoff poster, we also have a couple more character posters which show offf the casual and glam sides to our two heroes. You can check out the exciting chase clip for The Spy Who Dumped Me courtesy of Lionsgate movies along with all the cool new posters.